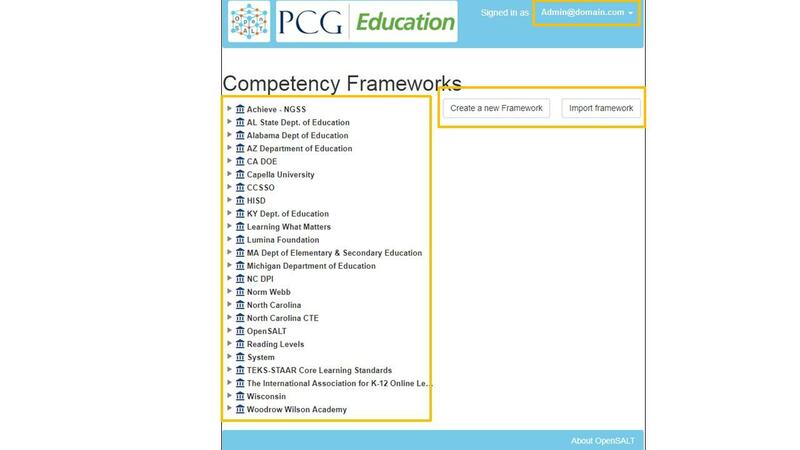 To support CASE, PCG Education (A national public sector consulting practice); ACT Inc and SchoolCity (both leading curriculum and assessment providers), partnered on the development of the open source project called OpenSALT, that provides a free, IMS-conformance certified tool that enables education organizations to manage and publish frameworks and crosswalks to other standards. Developed as an open source project, OpenSALT provides for easy exchange of state standards data and provides for and enables alignment services to align educational content to learning standards, as well as correlate (Crosswalk) between different state standards and competency frameworks. This document is intended as a complete guide for using OpenSALT. This document is specially designed for all users with advanced permissions or non-specialists who may find the document useful as a point of reference. By reading this guide, you will learn how to use OpenSALT through the elements of the graphical user interface (GUI) and explanations of some of the advanced features to provide best practices. This guide will help you to navigate and easily use OpenSALT. The functions and features described in this guide will indicate any role restrictions or limitations as to what users can access or interact with the given system function. The user interface is designed using current web standards and supports most modern browsers, in their current supported versions, on a variety of desktop and mobile devices. 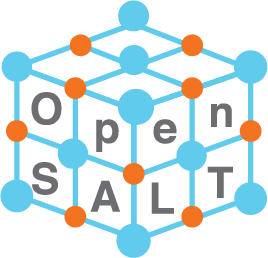 OpenSALT is designed to be an open, publicly accessible, framework site that allows transparency in frameworks and crosswalks. By design users are able to traverse and view the published frameworks and content by accessing the main url for the given site. OpenSALT then utilizes a login that allows provisioned users to create, edit and otherwise interact with the frameworks for the site. OpenSALT goes to the home page by default, and also has a document tree view. 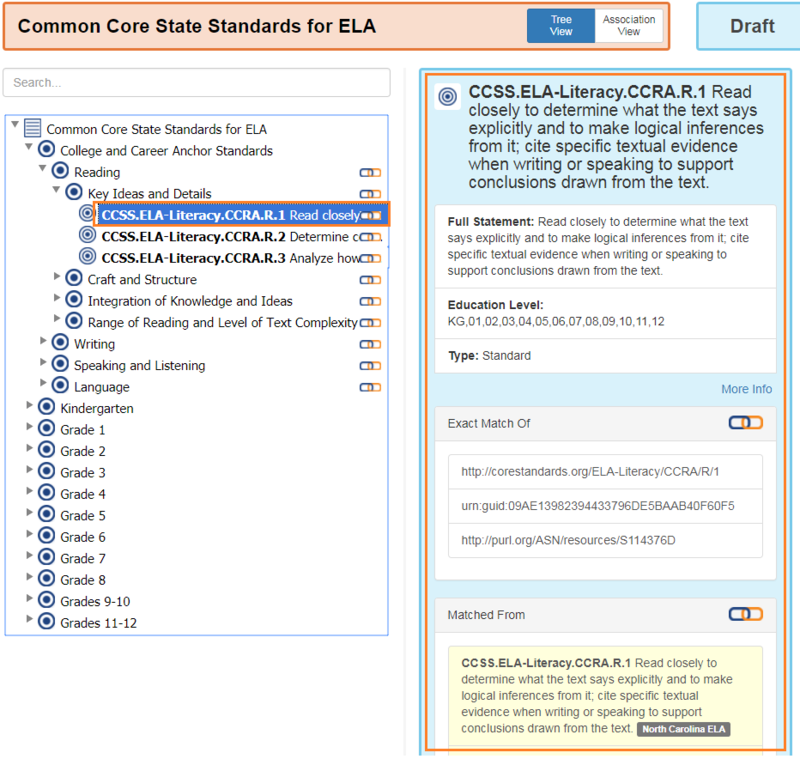 The Doc Tree View shows a framework and information about the framework on the right hand side, where logged in users with proper permissions can edit items, associate with other framework items, and copy other framework items into the current framework. The image below is an example of an OpenSALT site, OpenSALT.net hosted by PCG. When user launches opensalt.net in a browser, the user is presented with the open view of the site. 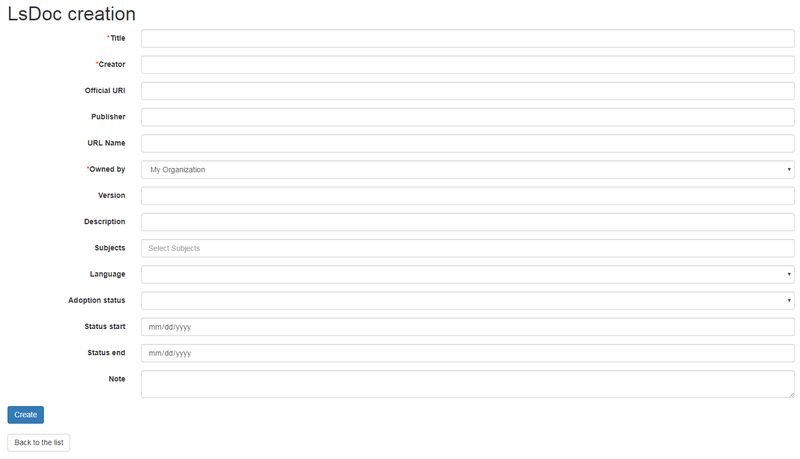 All public, non-provisioned users are able to view the frameworks and content with each form this view. Navigating the frameworks will be further discussed in a later section of this document. For provisioned users the Sign in button will launch a login screen that will enable deeper system usage and open up available menus for further interaction with OpenSALT. Provisioned users can enter in their Username (user’s email) and Password then click the Login button to access the admin functions for OpenSALT. All provisioned users should log out of OpenSALT when finished with their session. To logout, click on the expansion menu next to the user name and select Sign out. The Chart below provides an overview of the users and their provisioned roles and detailed descriptions follow. This is the top level in the user hierarchy for OpenSALT. A Super User has full permissions to the site and can create and manage organizations, manage users across all organizations, and manage all frameworks and content across all organizations. Much like the Super User, the Super Editor has has permissions to work across organizations however this user is only permitted to manage all frameworks and content across all organizations. The Super Editor has no access to manage organizations, nor users. The Organization Admin can manage users for their given organization, and manage and manage all frameworks and content for only their organization. They can not make personal frameworks. As discussed in section 2.1 Open SALT is designed to b a multi-tenant environment housing multiple organizations and users, though keeping all securely separated. In order to establish the separation, the Super User will need to create and manage organizations. 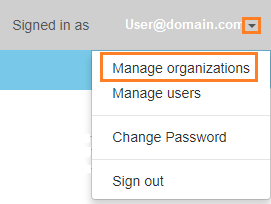 To access the Manage Organization page, after logging in the user should click the triangular menu icon next to their user name in the header of the page. The menu will expand with several options depending on the user’s role. Click on Manage Organizations to open the page. The Organization List is the default page displayed when a Super User accesses the Manage Organization function of OpenSALT. The list will display all organizations that the are currently in the given instance of OpenSALT. The Organization List provides the OpenSALT unique ID number, the Organization Name, and Actions for the organizations (Show and Edit). The page also has a button to Add a new organization. There are two ways to view an individual organization’s information beyond the Organization list table view. On the Organization List click on the linked ID number for the selected organization. On the Organization List click on the Show button in the Actions section of the Organization table for the selected organization. The Organization screen will display for the selected user. The Super User can see the Organization’s unique ID value and the Organization’s name. To create a new user, click on the Add new user button at the bottom right of the User list. Then click on the Add button to create the organization. If the Admin wants to cancel, and not create the organization, click the Back to the list button. On the Organization List click on the Edit button in the Actions section of the Organization table for the selected organization. On the Organization screen click on the Edit button. The Organization edit screen will display and allow the Admin to update the user’s information. Then click on the Save button to save the changes. If the Admin wants to cancel, and not edit the the organization, click the Back to the list button. The Admin can also delete the organization from this screen by clicking on the Delete button. If an organization needs to be completed removed from OpenSALT, the Admin should delete the organization. There are two methods to delete an organization. From the Organization List click on the Show button for the selected organization. The Organization page will be displayed and the Admin can click the Delete button to terminate the organization. Once deleted the organization cannot be restored. If the organization is needed, the Admin will need to create a new organization. From the Organization List click on the Edit button for the selected organization. 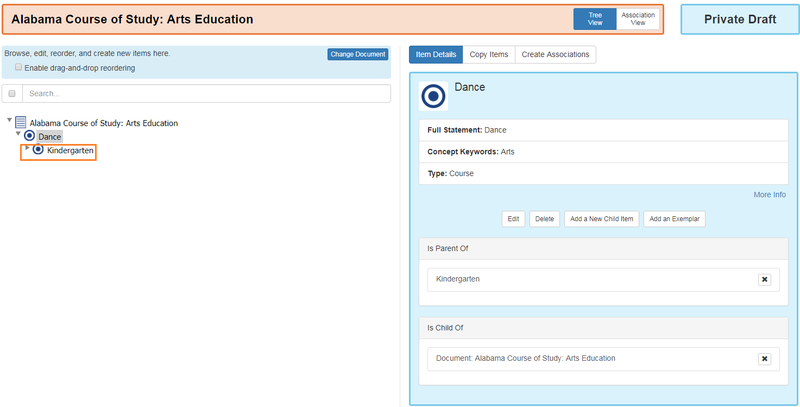 The Organization edit page will be displayed and the Admin can click the Delete button to terminate the organization. Once deleted the organization cannot be restored. If the organization is needed, the Admin will need to create a new organization. All provisioned users have the ability to change their password from the temporary one created by the Admin or as part of a good practice to regularly update their password to maintain a good security protocol. 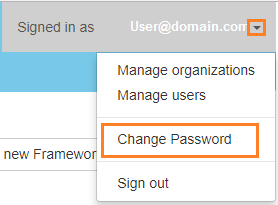 To access the Change Password page, after logging in the user should click the triangular menu icon next to their user name in the header of the page. The menu will expand with several options depending on the user’s role. However all provisioned users will have the menu option: Change Password. Click on Change Password to open the page. The user will then click the Change Password button. If the entered values validate as correct, the old password is equal to the user’s current password and the new and repeat passwords are the same, the system will change the user’s password to the newly selected value. If alny of the data is not validated, the system will prompt the user to correct the information before the change password can be completed. User account management is controlled by the Super Users and the Organization Admins. To access the Manage Users page, after logging in the user should click the triangular menu icon next to their user name in the header of the page. Click on Manage Users to open the page. The User List is the default page displayed when a Super User or Organization Admin accesses the Manage User function of OpenSALT. The list will display all users that the are currently in the given instance of OpenSALT. Super Users will see all users in all organizations, whereas Organization Admins will only see the users within their organization. The User List will display the OpenSALT unique ID for the user (as system generated incremented number), the Organization the user belongs to, the Username (email) The user’s role, and available actions (show, edit, Suspend) for the user. The page also has a button to Add a new user. Password: Type in a temporary password for the user. This password will not be viewable after creating the user. The Admin needs to take note of the temporary password entered to share with the user and the user will need to enter this password to change their password to a non-temporary secure password. Then click on the Add button to create the user. If the Admin wants to cancel, and not create the user, click the Back to the list button. There are two ways to view an individual user’s information beyond the User list table view. On the User List click on the linked ID number for the selected user. On the User List click on the Show button in the Actions section of the User table for the selected user. The User screen will display for the selected user. The Super User or Organization Admin can see the user’s Organization, Username, and assigned Role. On the User List click on the Edit button in the Actions section of the User table for the selected user. On the User screen click on the Edit button. The User edit screen will display and allow the Admin to update the user’s information. Username: If needed, type the user’s new email address. This will change the username that is entered when the user logs in. Password: If needed, type in a new temporary password for the user. This password will not be viewable after creating the user. The Admin needs to take note of the temporary password entered to share with the user and the user will need to enter this password to change their password to a non-temporary secure password. Role: If needed, select a new role for the user and uncheck the previous role. If the Admin wants to cancel, and not edit the the user, click the Back to the list button. The Admin can also delete the user from this screen by clicking on the Delete button. If an admin needs to prevent the user from accessing the OpenSALT instance, but needs to maintain the user’s account in the system ,the admin can Suspend the user’s account. To suspend an account the Admin will need to be on the User List page and select the Suspend button for the selected user. After clicking on the Suspend button, the user will be immediately suspended. The User list is updated to reflect the suspension and the account can now only be viewed through the Show button or unsuspended with the Unsuspend button. To reinstate a user’s account the Admin will access the User List and click on the Unsuspend button for the selected user. The User list will update and the account will be immediately unsuspended and the user can log in with the original credentials. If the user needs to have their password reset, the Admin can the edit the user by clicking the Edit button for the selected user and updated the password. If a user needs to be completed removed from OpenSALT, the Admin should delete the user. There are two methods to delete a user. From the User List click on the Show button for the selected user. The User page will be displayed and the Admin can click the Delete button to terminate the user account. Once deleted the account cannot be restored. If the account is needed, the Admin will need to create a new user account. From the User List click on the Edit button for the selected user. The User edit page will be displayed and the Admin can click the Delete button to terminate the user account. Once deleted the account cannot be restored. If the account is needed, the Admin will need to create a new user account. When a user launches an OpenSALT instance through their browser they will reach the Public view of the OpenSALT site. The following images represent a few of the current OpenSALT sites in operation. Note the default view has consistency from site to site. The variation is in the organization’s ability to add their organization logo and the content of the frameworks in the list. Public users can view all Organizations with Draft and Adopted Frameworks on the OpenSALT site. 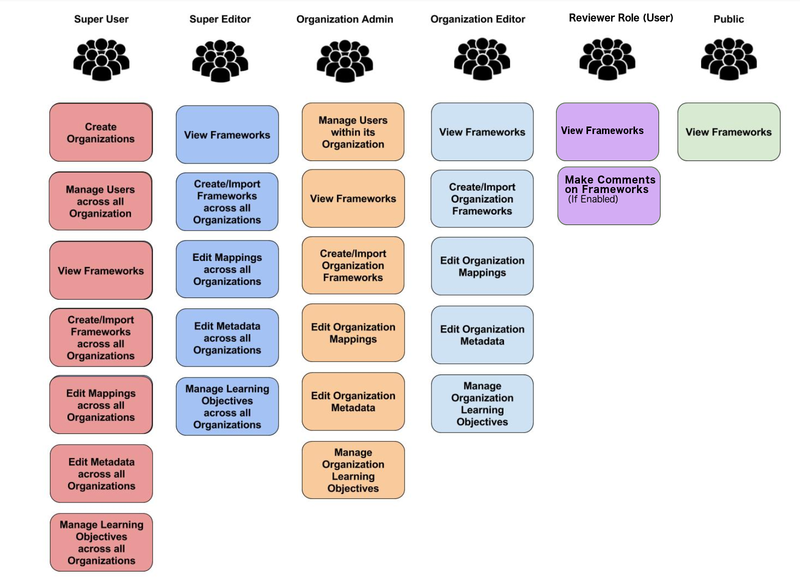 The default view is for all of the Organizations to be listed and their frameworks to be collapsed. The user can expand the ORganizations to see all available Frameworks by clicking on either the arrow to the left of the Organization name or on the name itself. If a user has credentials and logs into OpenSALT they will have additional buttons on this page, depending on their role and permissions. Additionally they will be able to see all frameworks that are in a Private Draft status as well. When a user click on a framework on the OpenSalt Home / Contents View Page OpenSALT will open the Framework Display page for the select framework. 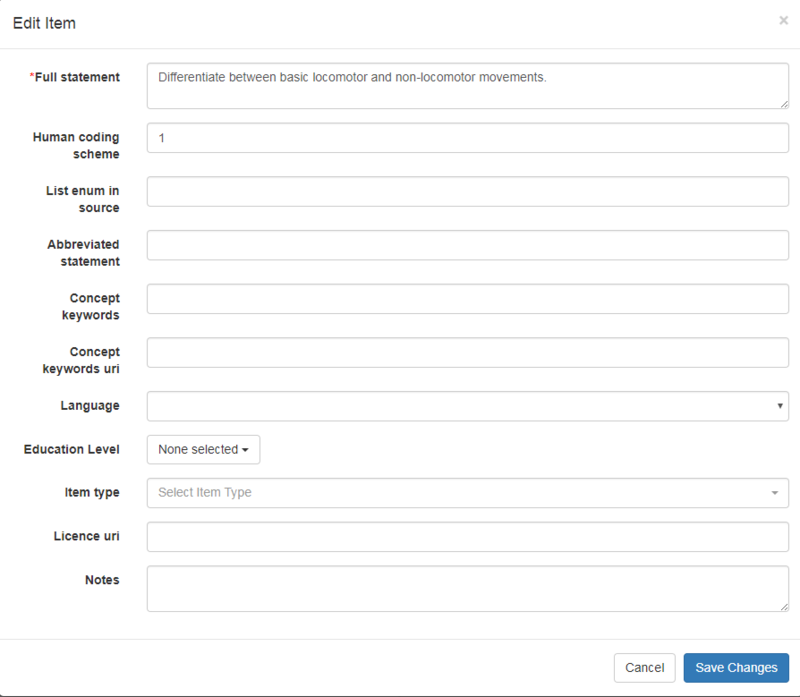 As a user clicks on a framework item, the Item Details frame will update to reflect the specifics for the selected item. 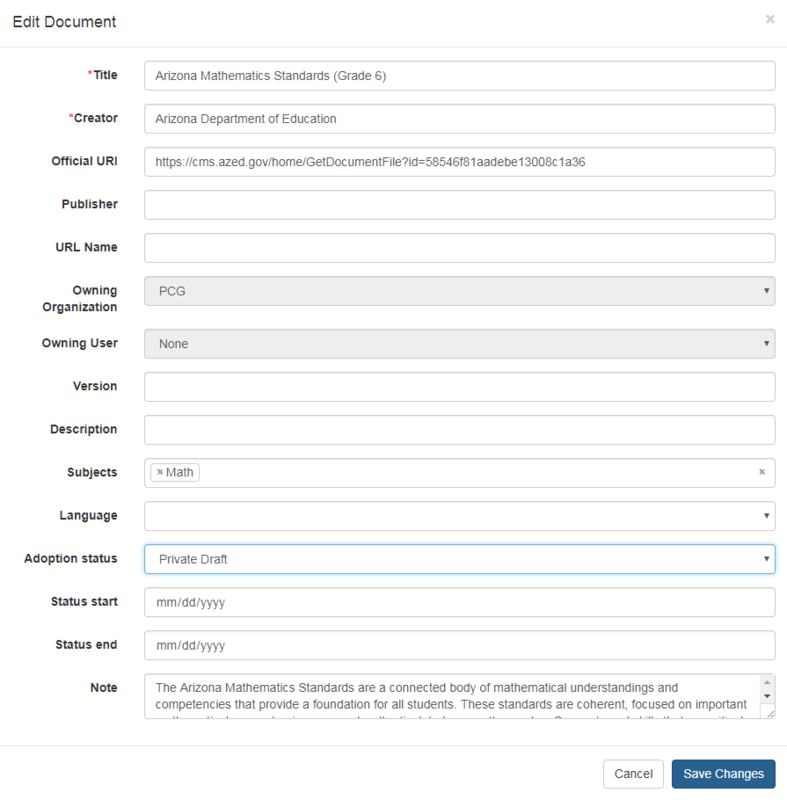 Credentialed users will have additional administrative controls and functions on the Display Framework page, depending on their role and permissions. OpenSALT has two methods for importing in an existing CASE-compliant framework into the site. To import data the user must first log into OpenSALT. After login, the Import Framework button will be displayed at the top of the screen. Click on the Import Framework button to open the Import Framework window. From this window the user can either Import a CASE-compliant JSON file or Import a Spreadsheet using the provided template. OpenSALT allows users to import known CASE-compliant framework files into the system. Click on the Import CASE file tab in the Import Framework window. Then click Choose File. Navigate on your computer to the correct Case-compliant JSON file to import then click Open. The filename will display in the Choose File box, then click the Import Framework button to import the framework. To cancel the action and not import the file, click on the Close button. To Create a Framework manually the credentialed user will click on the Create a new Framework button on the Framework Contents/OpenSalt Homepage after logging into OpenSALT. On the Framework Creation page, completed at a minimum the mandatory fields, though all fields should be filled in by best practice. Title: The title as it appears on the cover of the Official Source artifact, although it may be a title created by the Publisher. This is a mandatory field in OpenSALT. . Creator: The the entity that authorized or created the competency framework. It could be an education agency, higher education institution, professional body. It is the owner of the competency framework (e.g CCSSO, TEA, NGSS). This is a mandatory field for OpenSALT and will act as the Organization Folder on the Framework Contents/OpenSALT Home page. Official URI: The URL of the artifact adopted by the Standard Setting Entity. Often this document is published in html and/or as pdf and is used by the standard setting entity as part of its approval process. Since it is not the intent of this specification to fully reproduce the human-facing content and formatting of the source document, it is recommended that this document be transmitted as part of the competency framework package. This is an optional field in OpenSALT, though best practices indicate it should be filled in. Publisher: The entity that loads and publishes the Framework. 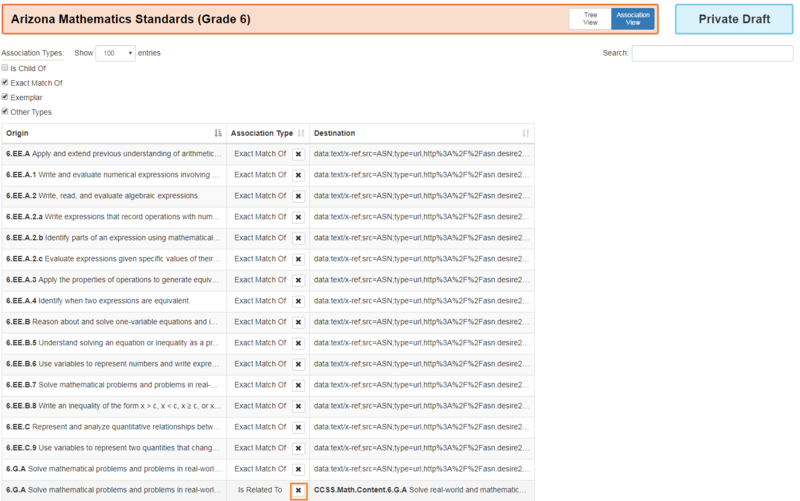 Note that in many cases, the Standard Setting Entity may lack technical capabilities to publish the Competency Framework in a standard format so a third party may be displayed. This is an optional field in OpenSALT, though best practices indicate it should be filled in. Owned By: Users will have the option to select from a few choices to indicate the Organization that created the Framework in OpenSALT. Other Organization (Named in the Dropdown) - Super Editor or Super User can select any Organization in OpenSALT. Version: This is used to separate any version information expressed by the Official Source artifact. Once and CF Pkg has been approved and published, any changes to an CF Item will constitute a new version of the CF Doc. This is an optional field in OpenSALT. If best practices are not followed, this field may be blank. 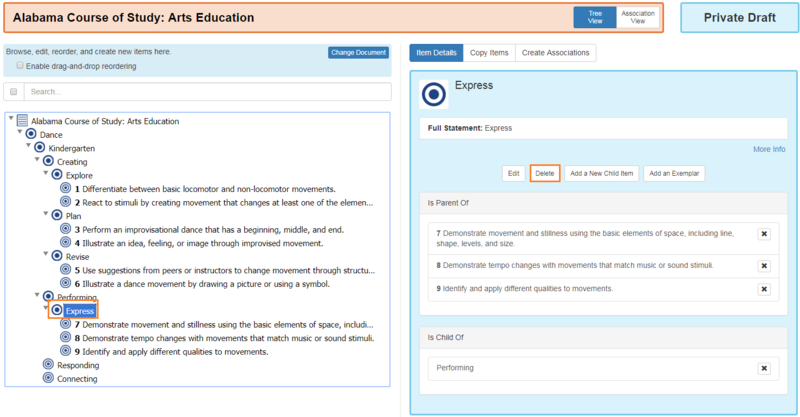 Description: The description is typically created by the the Publisher as a standard description of the Competency Framework.This is an optional field in OpenSALT. If best practices are not followed, this field may be blank. 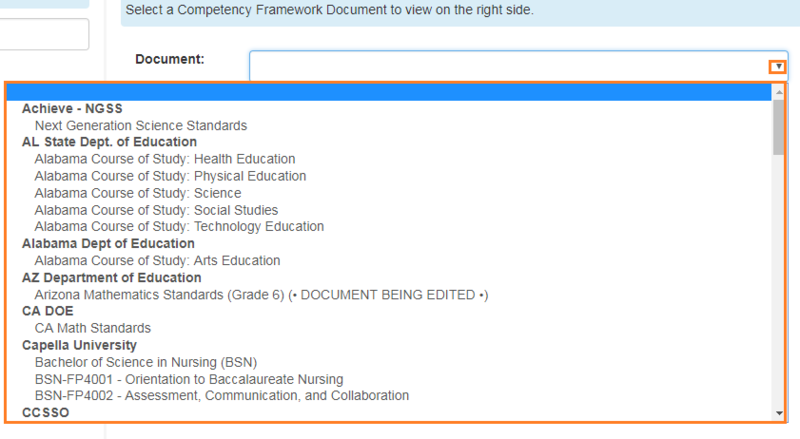 Subjects: This is a string expressing the general subject area of the Competency Framework (e.g. Mathematics). This is an optional field in OpenSALT. If best practices are not followed, this field may be blank. Language: HTML Language Country Code VIA- country code from https://tooCF.ietf.org/html/bcp47. This is an optional field in OpenSALT, though best practice indicates the filled should be filled in. However OpenSALT assumes English if not other language value is entered. Adoption Status: Adoption status displays the Framework’s current status as Draft, Private Draft, Adopted, or Deprecated. OpenSALT assumes Adopted as the default if no status is specifically selected for the framework. This is an optional field in OpenSALT. If best practices are not followed, this field may be blank. OpenSALT assumes Adopted as the default if no status is specifically selected for the framework. Draft: Able to be edited by Editors and Admins in an organization. Able to be viewed by the public. Status Start Date: The date that the CF Doc status started. This is an optional field in OpenSALT. Status End Date: This date is often only known when a new status is started. This is an optional field in OpenSALT. Note: Notes or comments generated by the Framework Publisher about the context of the Framework. This is an optional field in OpenSALT. To create the Framework, click the Create button. To cancel and abandon any changes, click the Back to the list button. When a Framework is created the Framework Display page will refresh and will indicate that are loaded with the framework. Open SALT Provides the user with suggestions for how to add items to the framework. To Edit a Framework the credentialed user will select the appropriate Framework from the Framework Contents/OpenSalt Home Page by expanding the Organization and clicking on the desired Framework. On the Framework Display page, click on the Edit button in the Detail Frame. The Edit Document window will open and allow the user to update the necessary fields. Title: The title as it appears on the cover of the Official Source artifact, although it may be a title created by the Publisher. This is a mandatory field in OpenSALT. Owning Organization: If a Framework is not a personal Framework, and rather is an Organizational Framework, the associated Organization that created or imported the Framework will be displayed. Owning User: If the Framework is a personal Framework owned by an individual user, the user’s name will be displayed. Otherwise the OpenSALT will assume a value of none because the Framework is not owned by a single user rather is owned by an Organization. To save the updated, click the Save Changes button. To cancel and abandon any changes, click the Cancel button. OpenSALT allows Super Users and Organization Admins to delete Frameworks if needed. Note once a Framework is deleted the action can not be undone. The framework and all associations will be permanently removed from the database. 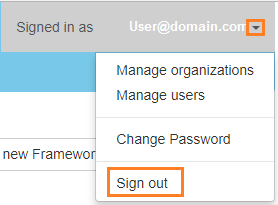 To delete a framework the Super User or Organization Admin will first need to log into OpenSALT. Next view the selected Framework by expanding the organization and clicking on the selected Framework. 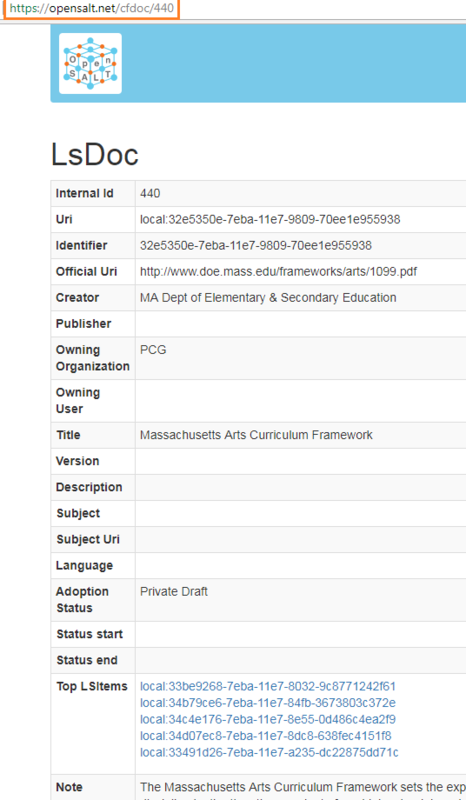 Take note of the document number in the Framework’s URL address in the browser bar of the Framework Display page. 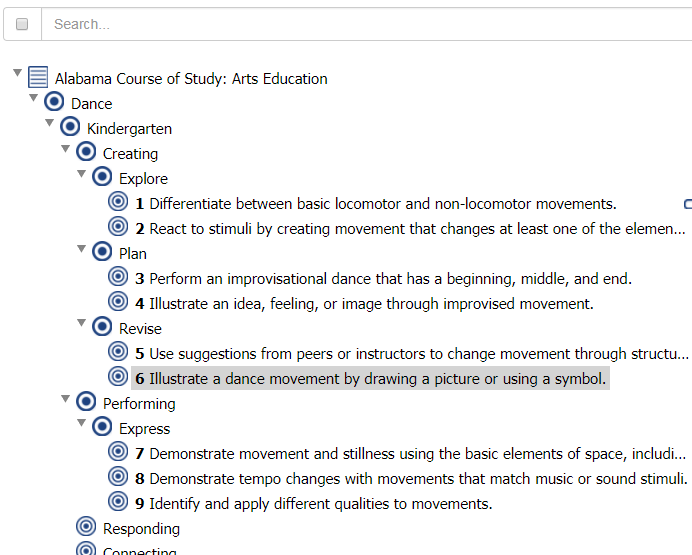 The LsDoc Page will display for the selected Framework. Confirm and confirm again you have the correct Framework selected. Once you are sure the correct Framework is selected and you are ready to delete, click the Delete button at the bottom of the page. Note this action can not be undone. Do not click Delete if you need to abort the action. If you need to return to your Frameworks and not delete the current select, click on the Back to the list button. Items can be created for Frameworks either by importing existing data using the OpenSALT template or by manually creating the items. Users can create their own CASE-compliant data files to load into OpenSALT using a provided template and guide. This allows users to easily import their items or standards into their created framework and eliminates the need for manually entering the data into the system. The template can be found here: Spreadsheet Loading Guide for CASE. The CSV Loading Guide for CASE provides a step by step explanation on the process to convert frameworks into CASE-Compliant data. The guide contains six (6) tabs to walk the user through the process. Most of these tabs are explanations of the process and the final tab is the template itself. An Overview of the process for creating the CSV to import the data. This graphic shows what is required to create a Framework. Please note this data does not need to be contained in the CSV file as it will be created when the user creates the framework in OpenSALT. Explanation of the item fields that will be included in template for the Framework. Note that technically only fullStatement and humanCodingScheme are required. The process for associations which can be associated in the template if desired, though associations may be easier managed in the UI itself after the Framework is created and imported. The fifth tab is an example or sample of a filled in/completed template with data to be imported into OpenSALT. The template itself that will be used to add the data into the correct format and saved as a CSV to import into OpenSALT. Notes: The only required fields are fullStatement and HumanCodingScheme. SequenceNumber or IsChildOf are needed to properly created nested trees of statements as well. After reviewing the Spreadsheet Loading Guide for CASE and the user will need to format their data into the Template Tab then save the file locally to their computer as a CSV file. 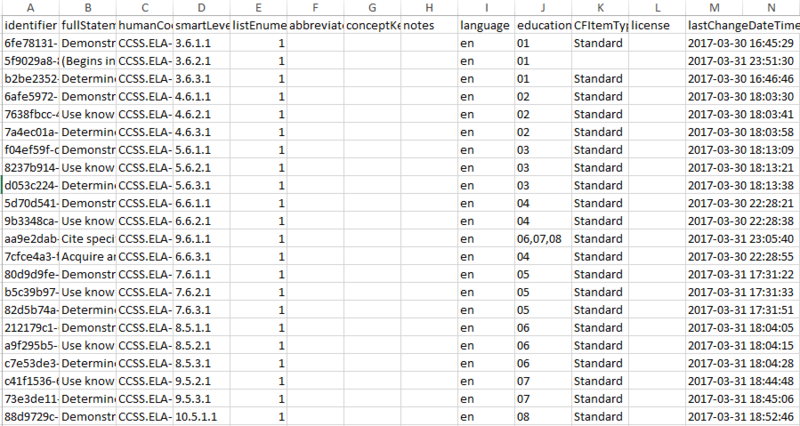 This will save only the Template Tab and convert the data from an Excel file to a CSV file for import. Next the user will need to Import the items/children for the Frameworks. Click on the Import Children button in the Item Details Frame on the right of the selected framework to open the Import Items window. Select the tab for where your template file is located. 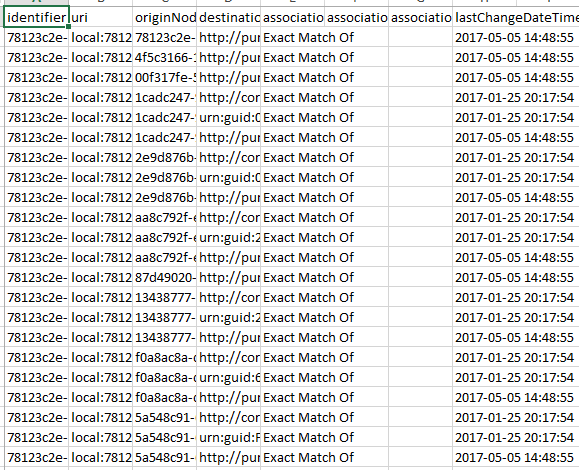 If the CSV is stored locally on your computer, click on the Import local File tab. Browse and select your file with the Choose File button. If a specific Framework to be associated is preferred, mark that selection otherwise the default is All. Then click the Import Children button to import the items for the framework. Alternatively if the template is stored in your GitHub repository, click on the Import from GitHUb tab and login to connect to your file and import the items for the framework. The items will be loaded and the Framework Display page will be refreshed. On import, error messages will display when a file is missing fields. These error messages can be retrieved afterwards by clicking on “error log” in the admin console. These three formatting options for text can be combined in-line with limitations. Note that since OpenSALT uses markdown(markdown-it) as the primary formatting language, there could be unintended formatting consequences when importing from external sources. Alternatively, block text LaTeX is formatted as braced between double dollar signs ($$). HTML and LaTeX cannot be combined in-line with anything else. In the subsections below example text is showin in two columns; the first column shows the Markdown special characters, while the right column shows the text in the way it presents to the end user. The toggle shifts between preview mode and pure text edit mode. This two column view is depicted in all examples above and is the easiest way to edit and format text. This does not cause the area to expand to the full monitor width, bur rather to the width of the pop-up dialogue. Underline may be utilized by entering Markdown’s emphasis tag, or placing _underscore_ on either end of a word or phrase. When a Framework is created it is item neutral and is open for organizational content to be added based on the user’s needs. In addition to the Item import in section 6.5.1, OpenSALT allows users to manually create items and organize the data through the OpenSALT UI. 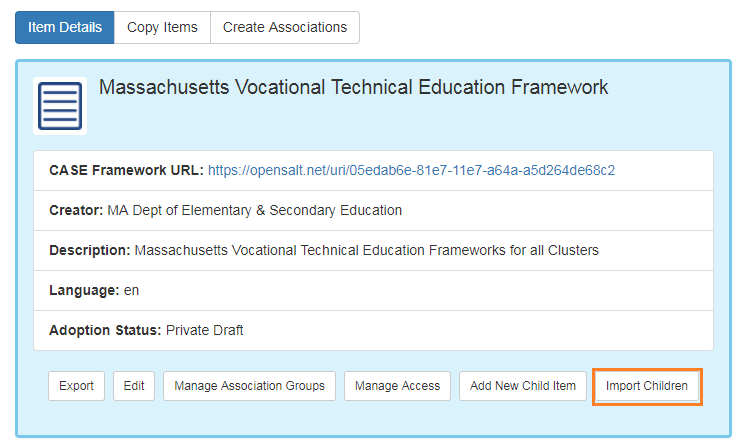 On the Framework Display page, click on the Item or Framework name that will act as a parent for the item to be added. Then in the Item Details Frame click on the Add New Child Item button. The Add New Child Item window will display. Enter in the appropriate values for all available fields. At a minimum enter in mandatory Full Statement. FullStatement: The the main content of the CF Item. It is used to express both nodes and granular statements. If the statement is part of a list, the list enumeration should not be included in the statement and should instead be contained in the List Enumeration in Source Document. This is a mandatory field in OpenSALT. HumanCodingScheme: The ID sometimes used by humans to identify a CF Item. It often will use concatenated codes expressing its position in the taxonomy and abbreviations to convey other classification information (e.g. K.CC.1.1). This is an optional field in OpenSALT. ListEnumeration: Used to parse out enumerations or bullets that precede CF Item statements. This is an optional field in OpenSALT..
AbbreviatedStatement: Abbreviated or summary statement provided by the Publisher. This is an optional field in OpenSALT and may be blank. ConceptKeywords: Upper level CF Item node statements may be used to populate Concept Keywords of lower level nodes. upper The concepts data structure allows a master list of keywords to be defined which can then be parsed down specific to a node. This works as usually concepts will be a less granular hierarchy representation of of the more detailed nodes in CF items. A node could be ‘Geometry’ and the lower node is ‘Tangents’ but the keywords for ‘tangents’ could include the word geometry. This is an optional field in OpenSALT and may be blank. Language: HTML Language Country Code VIA- country code from https://tooCF.ietf.org/html/bcp47. This is an optional field in OpenSALT. If best practices are not followed, this field may be blank. However OpenSALT assumes English if not other language value is entered. EducationLevel: The current US K12 defined vocabulary is to use CEDS https://ceds.ed.gov/cedselementdetaiCF.aspx?termid=8267. Multiple values are allowed via comma delimitation and should be used to express grade spans. This is an optional field in OpenSALT and may be blank. ItemType: e.g., “Standard,” “Benchmark,” “Strand,” or “Topic.” or “Level 1, Level 2,…” This is an optional field in OpenSALT and may be blank. License uri: Systems may filter for content with particular licences to support discovery. This is an optional field in OpenSALT and may be blank. Notes: In some cases, this can be used to contain additional information found in the original source document. This is an optional field in OpenSALT and may be blank. To create the item, click the Create button. To cancel and discard the changes, click the Cancel button. Once the Item is created it will by default only be a child of the item it was created for. To add items nested below the item created, the user will need to make this item a Parent item. Highlight the item on in the Framework Display and click on the Make This Item a Parent button in the Item Detail Frame. The bullet icon on the left of the item in the Framework Display will update to reflect it is now a P**arent item** and the buttons in the Item Detail Frame will update to allow the user to either downgrade back to a child with the Make This Item a Child button or to add a new child for this parent item with the Add a New Child button. The user can toggle the item between Parent or Child as necessary by clicking the Make This Item a Parent or Make this Item a Child buttons respectively. Note an item can be a Child of an item and a Parent to other items, however an item can not be a Child of an item with children below it. This item must be upgraded to a Parent to have children. 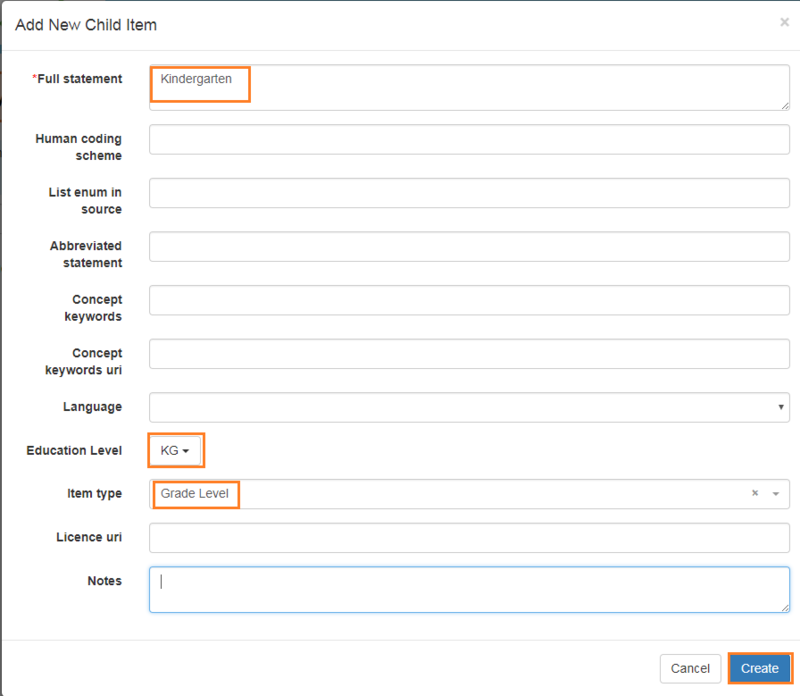 The user can repeat this process an unlimited number of times to continue adding all items and marking them as Parents when appropriate to complete the full content for the framework. To edit an item, the user must click on the item in the Framework Display and then click on the Edit button in the Item Detail Frame. The Edit Item window will display. And the user can alter the data fields as needed. To save the changes, click the Save Changes button. To cancel and discard the changes , click the Cancel button. OpenSALT enables users to move items within frameworks and reorder without the need to edit each item. The user must first enable the functionality but checkin on the box at the top of the Framework Display to Enable drag-drop reordering. With the box checked and the function enabled, the user can now click on an item and drag and drop it to another location. Note clicking on a child will only move the child, whereas selecting a Parent will move the parent and all of it’s children. Note with the drag and drop feature, items can be indented (moved to new parents) outdented to become parents, and all data can be fully moved around. However once an item is moved, there is no undo button, so the user would need to manually move (drag/drop) the item to the original position if the move is not required or done in error. Because of this, the feature is always defaulted to unchecked so no errors are accidentally made. All credentialed users can delete items that they have access to edit. 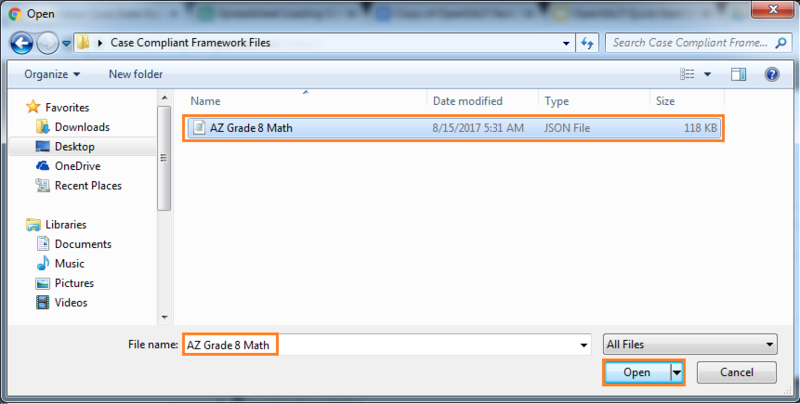 To delete a child item, the user must click on the item in the Framework Display and then click on the Delete button in the Item Detail Frame. The delete action can not be undone. The user will be prompted with a warning message and must acknowledge the action cannot be reversed by clicking on the Delete button to proceed. To cancel and leave the item in the Framework, click the Cancel button. To delete a parent item, the user must click on the item in the Framework Display and then click on the Delete button in the Item Detail Frame. The delete action can not be undone. The user will be prompted with a warning message that the item and all of it’s children will be deleted if the user proceeds. The user and must acknowledge the action cannot be reversed by clicking on the Delete button to proceed. OpenSALT provides the ability for a user to connect an example or Exemplar to any item within a Framework. 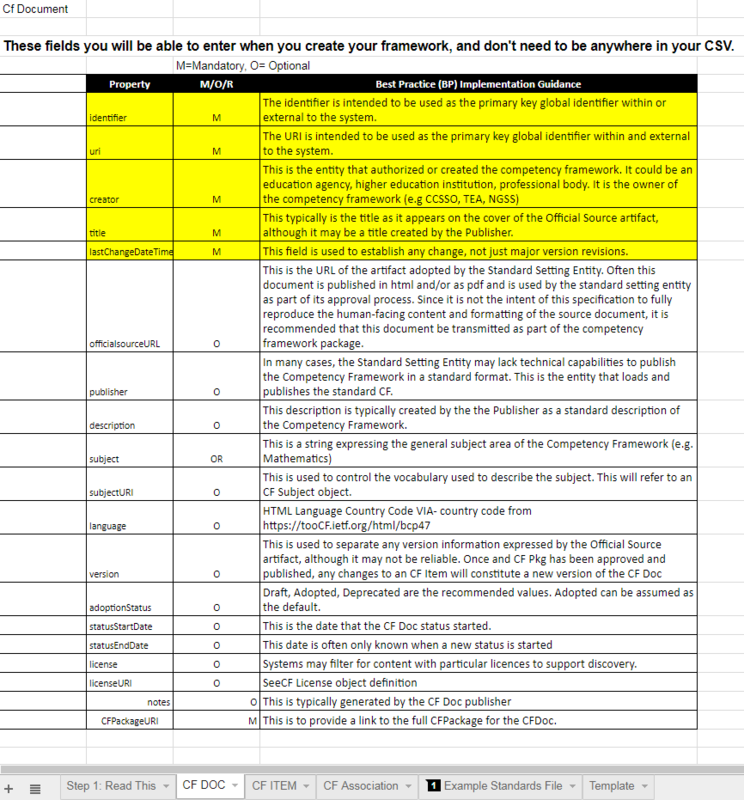 Note the Exemplars can not be associated to the Framework, rather only the items within. However an Exemplar can be associated to a Parent or a Child Item. To connect an example or Exemplar to an item. 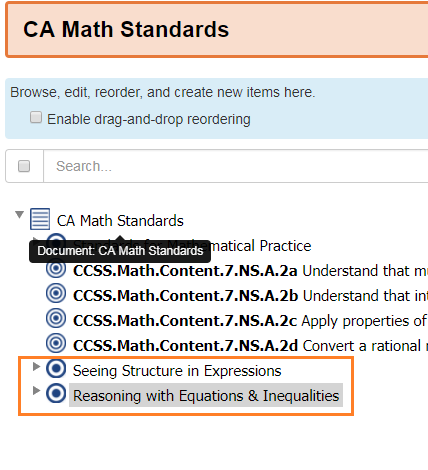 Select the item within the framework on the Framework Display page. Then click on the Add Exemplar button on in the Item Details Frame. The Add an Exemplar window will open. The user can either enter in a URL to an Exemplar or type text into the box. To save the Exemplar, click on the Add Exemplar button. To discard changes click on the Cancel button. 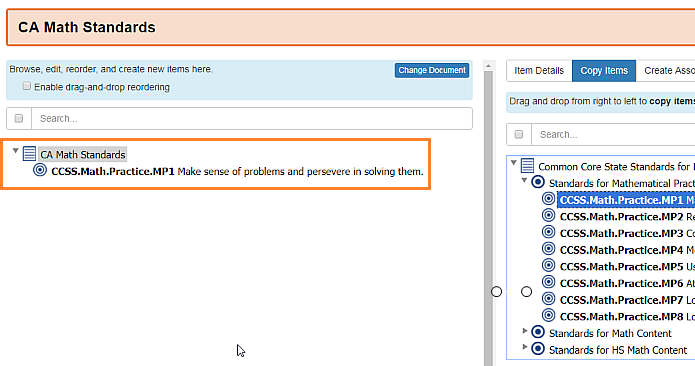 After clicking the Add Exemplar button, the F**ramework Display** page will refresh and the exemplar is linked to the item. This can be verified in the Item Detail Frame. 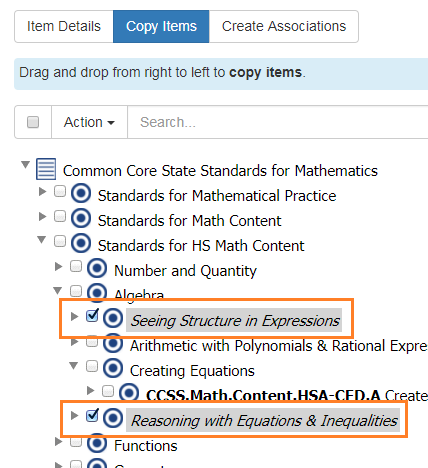 To delete an Exemplar from an item, click on the ‘x’ icon next to the exemplar detail in the Exemplar section of the I**tem Detail Frame** on the Framework Display page. Note this action can not be reversed once completed. The user will be promoted with a warning message to proceed. Note this action can not be reversed once completed. The user will be promoted with a warning message and must acknowledge the OK button to proceed. OpenSALT allows users to create derivative frameworks from frameworks within an OpenSALT server or instance. Creating a derivative framework allows organizations to take a base original copy of a framework and expand it to better meet its needs. 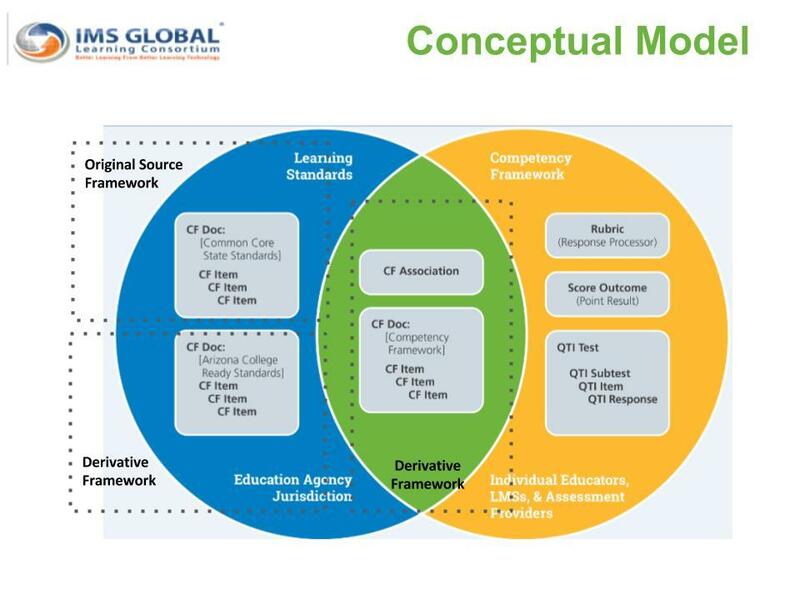 The illustration below shows how the derivative frameworks fit with the scope of frameworks as a whole. Derivative frameworks essentially act as a bridge for organizations to navigate education needs. The user will need to be logged into OpenSALT and create or select the framework that will act as the new derivative framework or copy. Please see section 6.2.2 Manually Create Frameworks if assistance is needed on how to create a framework. On the Framework Display page, click on the Copy Items button in the Item Detail frame. In the C**opy Items** frame select the document/Framework to copy. Note if the framework to copy is not listed in the document view it is not currently on the OpenSALT server. Please see section 6.2.1 for instructions on importing frameworks into OpenSALT. Select the desired framework in the Document dropdown. 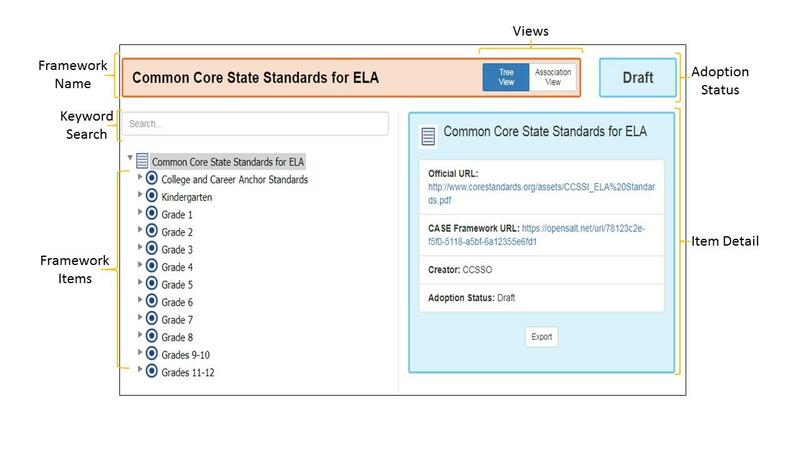 The Copy ITems frame will refresh and load the selected framework so its items can be viewed. The user can now select individual items or the full set to copy over to the derivative framework on Framework Display on the left. To select and copy a single item, expand the framework to the level/item desired. Click on the item and drag and drop it to the appropriate location on the left. When the user releases the item on the left, the framework will refresh and the item will now display as part of the framework. 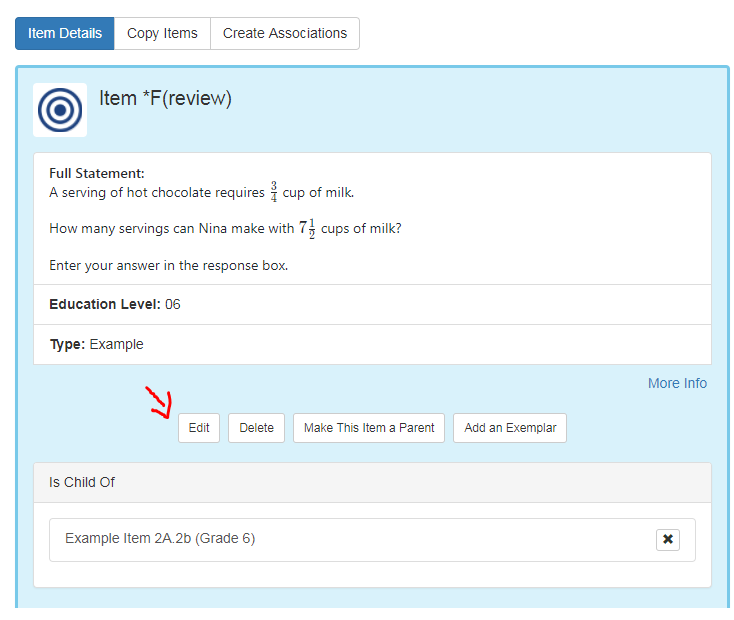 A user can select a parent item and add it to the framework, which will copy over all children under the parent as well. To select multiple items at once the user can expand the multi select function by clicking on the empty checkbox above the framework displayed in the Copy Items frame. The user can now check one or more boxes and click on an item to drag and drop to the left. All items selected will move. 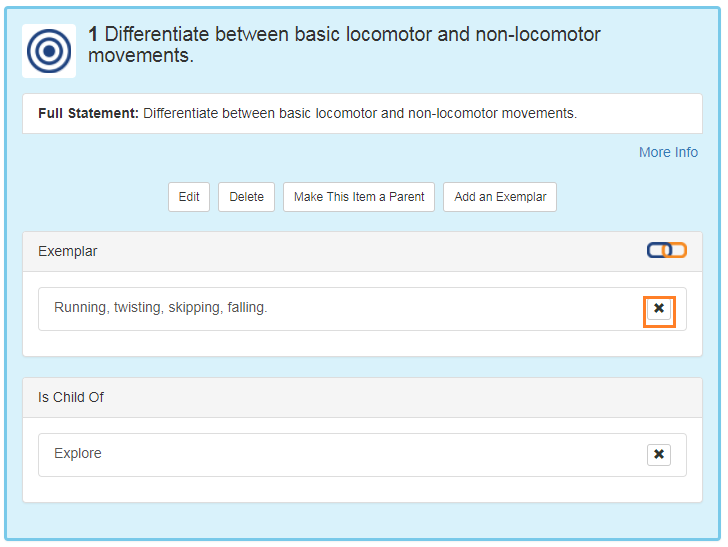 Note if a Parent is selected all the children will also move with it even if they are not individually checked. Note to close the multi select function, click on Actions and select Hide Checkboxes. OpenSALT provides users with a robust way to include associations following the IMS GLobal CASE Standards. The application enables users to connect frameworks and framework items together to bring together relationship models that integrate and blend frameworks in a meaningful way. The illustration below provides a visual mapping for how associations can connect frameworks and help to crosswalk standards. exactMatchOf Equivalent to. Used to connect derived CFItem to CFItem in original source CFDocument. exemplar The target/destination node is an example of best practice for the definition of the source/origin. hasSkillLevel The destination of this association is understood to define a given skill level i.e. Reading Lexile 100, Depth Knowledge 2, or Cognitive Level (Blooms Taxonomy) etc. isChildOf To represent the structural relationship in a taxonomy between parent and child. The source/origin is a child of the target/destination. isPartOf The origin of the association is included either physically or logically in the item at the destination of the association. This classifies an item as being logically or semantically contained as a subset of the destination. isPeerOf The source/origin is a peer of of the target/destination. isRelatedTo The origin of the association is related to the destination in some way that is not better described by another association type. precedes The origin of the association comes before the destination of the association in time or order. replacedBy The origin of the association has been supplanted by, displaced by, or superseded by the destination of the association. OpenSALT allows users to create associations to and between Framework items that either reside in the same OpenSALT instance or to any other outside CASE-compliant system. To create an association, open the Framework target in the Framework Dispaly page.then click Create Associations to open the Associations frame. In the Document dropdown, select the framework you want to use with the associations. If the framework is within the OpenSALT server instance, the framework name will display organized by the owning Organization. 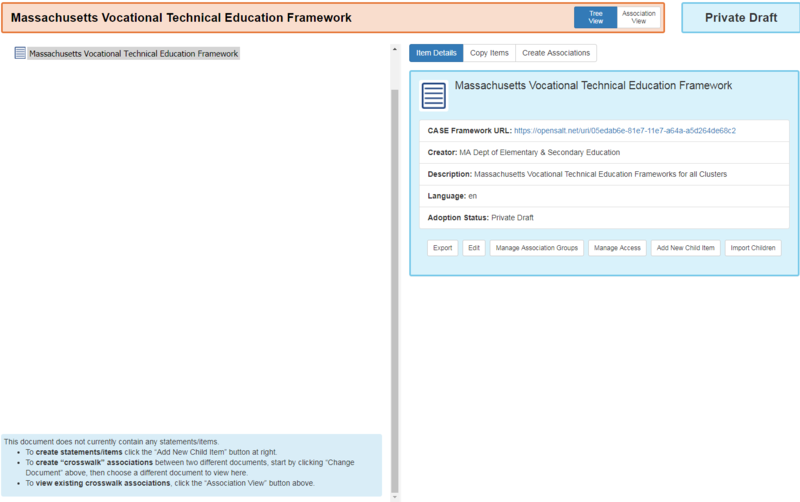 Click on the required Framework to display the framework and items. Alternatively you can select The final option: Load an “external” document by url… This allows the user to select any CASE compliant framework that is stored on an external location. The Load External Document window will display. The user will need to copy and paste, or type in the url for the Case-compliant framework. In instances of OpenSALT, the Case Framework URL can be found on the Framework Display page in the Item Detail frame. Note if the copied URL does not have the .JSON extension, you will need to add it for the document to load. To load the framework, click the Load Document button. To cancel and return to the Framework Display page, click the Cancel button. 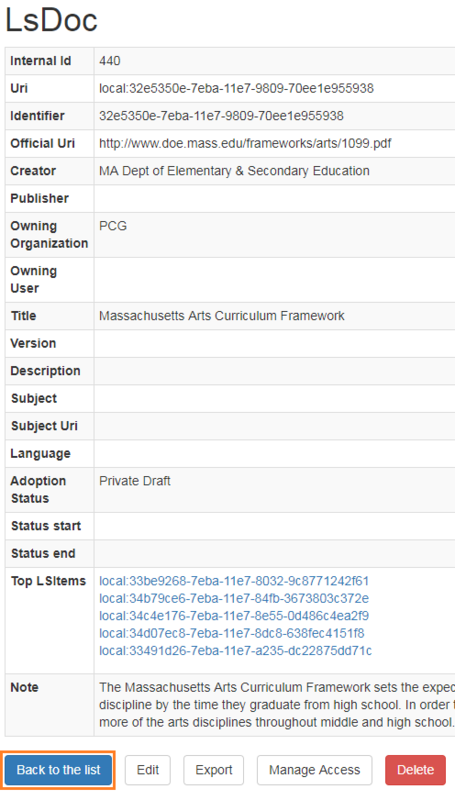 The selected framework will display in the Create Associations frame. Select the item from the right by clicking on it and dragging it over the associated item on the left. The Create Association window will display showing the item that was both dragged and dropped as well as the item that it was connected to. The user can select the Relationship Type from the drop down and change the relationship arrow as needed by clicking on the Switch button. To save the association, click the Associate button. To cancel and abandon the association, click the Cancel button. The Framework Display page will refresh. If the user clicks on the item in the Framework Display and then clicks Item Details , the newly created association will be visible. 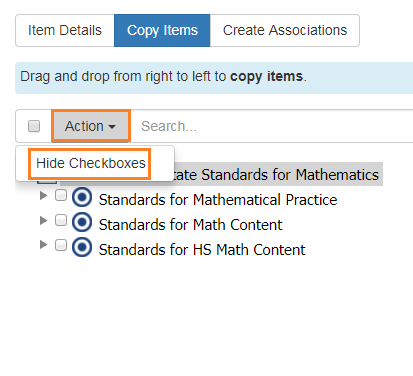 To add several of the same type of association to one item, the user can open the multi select function by clicking on the empty checkbox above the framework displayed in the Create Associations frame. The user can now check one or more boxes and click on an item to drag and drop to the left. All items selected will become part of the association. Note if a Parent is selected all the children will associate even if they are not individually checked. When the users drags the items to the the left and associates them with an item, the Create Associations window will display. The user will note that the list will only display the first of the associated item, and will indicate there are additional items selected. Also note all items will have the same association, as you can only select one association type. Set the associations as required and click the Associate button. To Edit an association, the user must delete the association and create a new association. PLease see section 6.6.1.2 for how to delete an association and 6.6.1.1 for how to create a new association. Users can either use the Tree View or the Association View to delete associations. On the Framework Display page, click on the Tree View button if not already selected. Then locate the association in the I**tem Detail** frame. Click the X icon next to the association to remove. The user will get a popup window warning that he action can not be undone. If the user wants to proceed and delete the association, the user will click the OK button. Otherwise the user can cancel by clicking on the Cancel button. 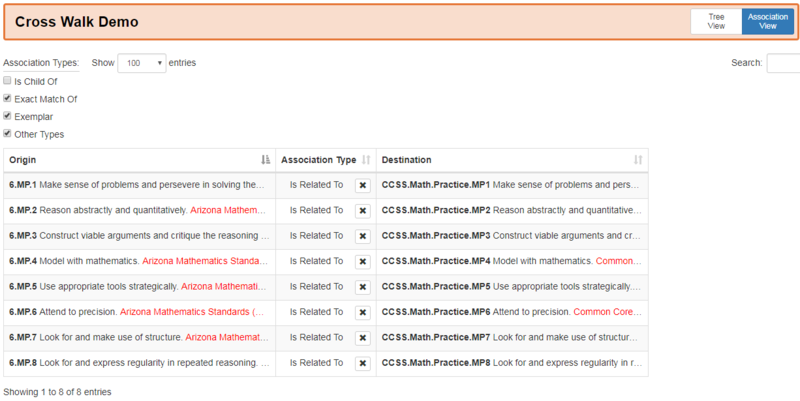 On the Framework Display page, click on the Association View button if not already selected. Locate the association in the in the list to be deleted. Click the X icon next to the association to remove. On the Framework Display page, click the Manage Association Groups button in the Item Detail frame. The Manage Association Groups window will display. Click on the Add a New Association Group button. The Add New Association Group window will display. The user will need to enter a Title and the optional Description. Next click on the Create button. The user will repeat the process to add any needed Association Groups. After creating the required Association Groups, the user can Edit a Group, Delete a Group or click Done. 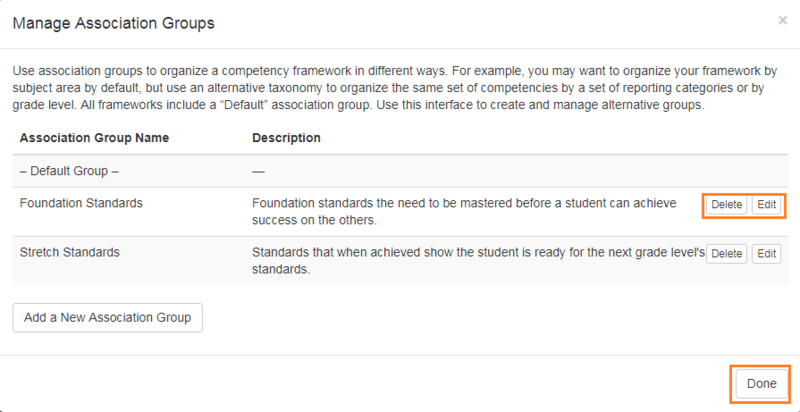 The filter option for the Association Groups will now display on the Display Frameworks page. 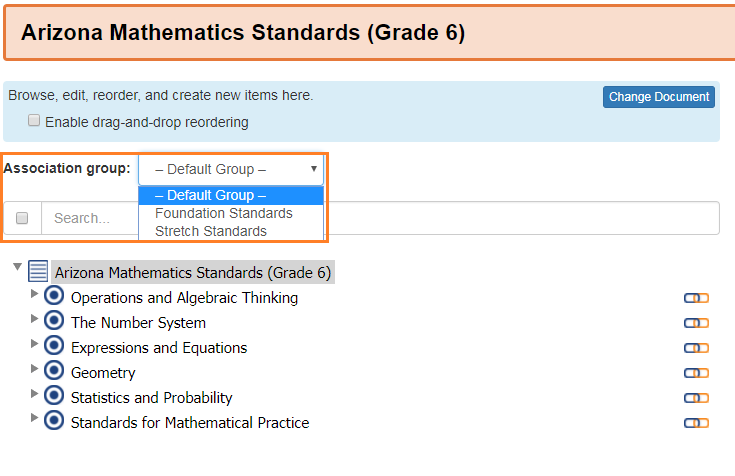 The user will now need to associate items with the appropriate groups. OpenSALT allows for users to create crosswalks between frameworks. To create a crosswalk the user will need to start with an empty framework. 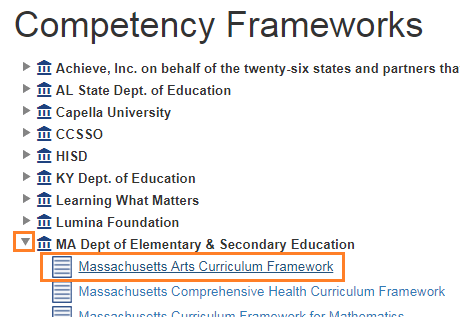 For instructions on creating a framework see section 6.2.2. Open the framework to the Display Framework page. In the click on Change Document to select the first framework to use in the crosswalk. This will open a Document dropdown. The user can select a framework that is in their current OpenSALT server from the list by clicking on the desired framework. Alternatively the user can connect to a framework that is outside their system by selecting the final option: Load an “external” document by url… This allows the user to select any CASE compliant framework that is stored on an external location. Next the user will click on the Create Association option above the Item Detail frame. A Document dropdown will display to allow the user to select the second framework to be selected. Again the user can select an existing framework from their OpenSALT server or can select an outside CASE-compliant framework. The user can now use drag and drop to select items from the right and drag to connect to items on the left to establish the cross walk. 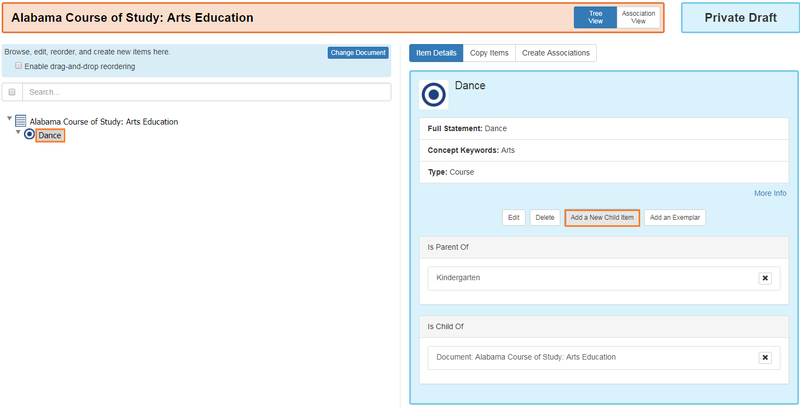 After an association is connected with the drag and drop, the Create Association window will display and the user can define the association. When the user is satisfied with the association definition, click on the Associate button. To cancel, click on the Cancel button. The user should repeat this process to connect all required framework items for the crosswalk. 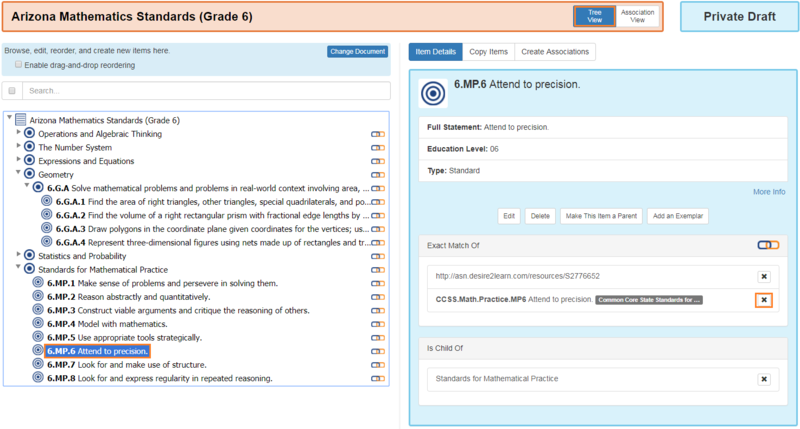 To view the cross walk, the user will click on the Association View at the top of the screen. To Edit a crosswalk association, the user must delete the associations and create new associations. Please see section 6.6.1.2 for how to delete an association and 6.6.1.1 for how to create a new association. Alternatively if the entire crosswalk needs to be deleted and all associations, the user can delete the framework instead of removing all associations. Please see section 6.8 for instructions on deleting a framework. OpenSALT is designed to enable all users roles to Export complete framework packages or documents. 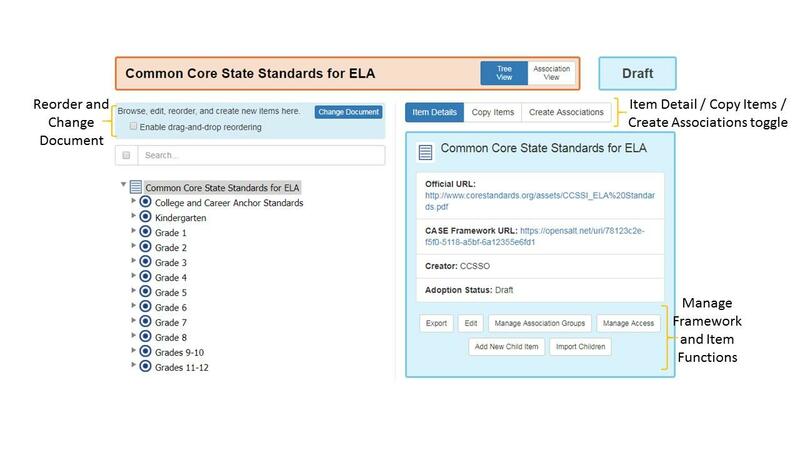 While Public users can only export framework packages that are in an Adopted, Draft, or Depreciated release status, credentialed users will have the ability to export Draft and Private Draft framework packages as well. To Export a framework package the user needs to be on the Framework Display page for the selected framework and then click on the Export button. The user can select an Export option or can click on the Done button or the ‘X’ at the top of the window to close the Export window. Each Export type will be discussed in the following subsections. 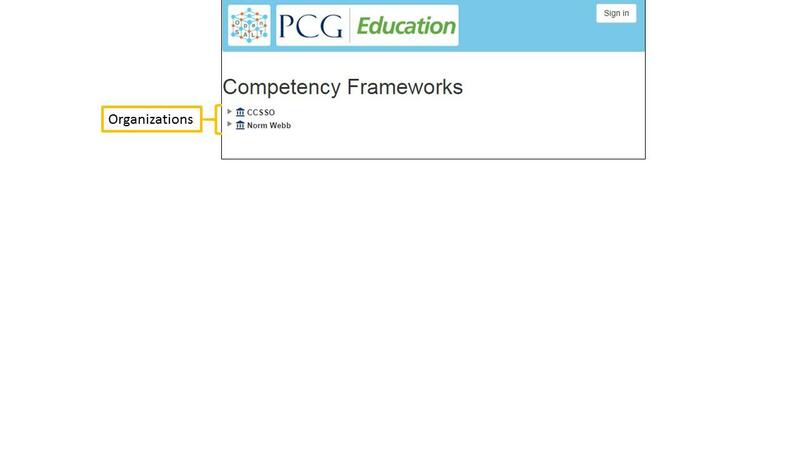 To generate a JSON file for the Framework Package, the user will click on the Competency Framework Package (JSON) button. The browser will automatically create and down load a JSON file for the Framework Package. The user will need to retrieve the file following the browser’s specific protocol and path. The image below shows the download in Chrome. Note the file is in the download frame at the bottom of the page. It has also been added to the user’s Download folder within the user’s My Documents. To open the JSON file the user will need to identify a compatible application on their computer. Notepad or NotePad ++ can be used if no preferred application is identified. The following is an example of the generated JSON file viewed in Notepad. The second Export option is the Styled PDF button. The purpose of this Export option is to produce a system generated PDF with nice formatting and styling that can be used to compare against a source document for validation or can replace source documentation as needed. Users will note that at this time the button is not active. A description will not display when a user mouses-over the button, nor will the button respond with clicked. This is a placeholder for future functionality. As of the current release of OpenSALT this feature is not available. Though it is on the road map and is expected to be in a future release. If any organization requires this functionality, you can sponsor the development of the feature to help prioritize the development timeline by contacting PCG, ACT, or School City to discuss development costs and your needs. The third Export option is the Spreadsheet Export. 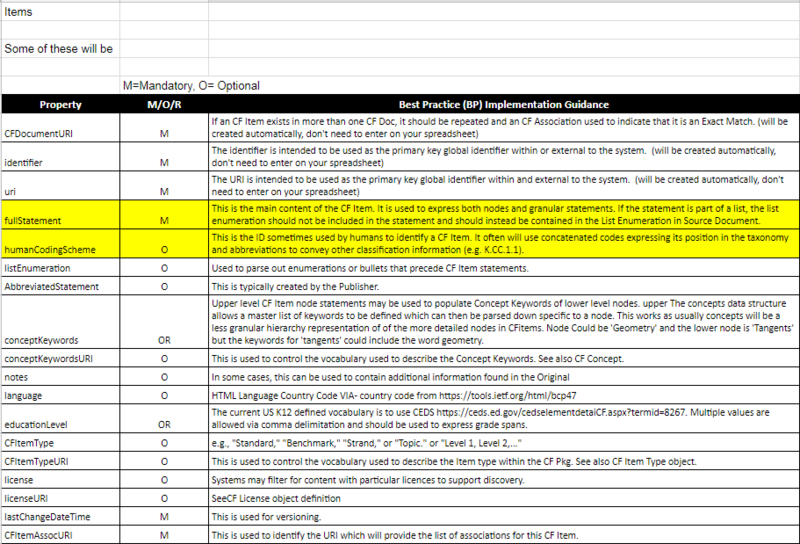 This option allows users to extract the data for the framework packaging in a spreadsheet file that can be opened/viewed/edited in a program like Microsoft’s Excel or Google Sheets. To generate a spreadsheet file for the Framework Package, the user will click on the Spreadsheet Export button. The browser will automatically create and download a case xlsx file for the Framework Package. The user will need to retrieve the file following the browser’s specific protocol and path. The image below shows the download in Chrome. Note the file is in the download frame at the bottom of the page. It has also been added to the user’s Download folder within the user’s My Documents. To open the spreadsheet file the user will need to identify a compatible application on their computer. The most common applications used are Microsoft Excel or Google Sheets. Users credentialed users who are experienced with importing Frameworks into OpenSALT with the CASE template will already be familiar with this spreadsheet format. For all other users, the following details the exported spreadsheet file. The purpose of the first tab, CF Doc, is to provide the user with basic background information on the Framework Package. Identifier: The identifier is intended to be used as the primary key global identifier within or external to the system. This is a mandatory field in OpenSALT and the export will contain data. 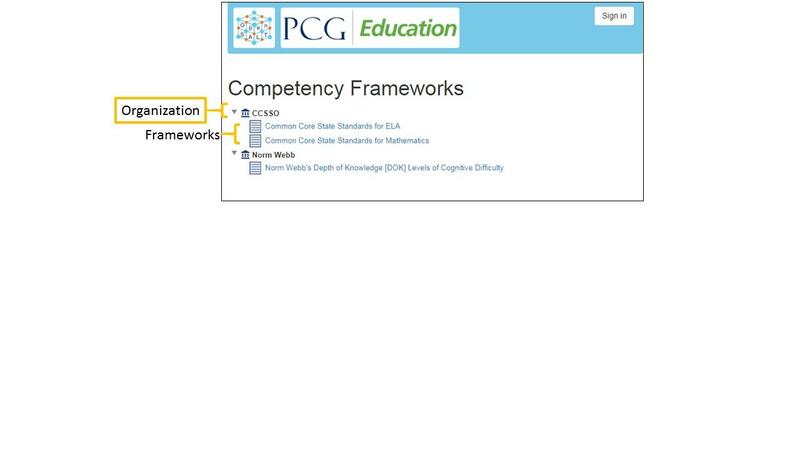 Creator: The entity that authorized or created the competency framework. It could be an education agency, higher education institution, professional body. It is the owner of the competency framework (e.g CCSSO, TEA, NGSS). This is a mandatory field in OpenSALT and the export will contain data. Title: The title as it appears on the cover of the Official Source artifact, although it may be a title created by the Publisher. This is a mandatory field in OpenSALT and the export will contain data. LastChangeDateTime: The field is used to establish any change, not just major version revisions. This is a mandatory field in OpenSALT and the export will contain data. OfficialsourceURL: The URL of the artifact adopted by the Standard Setting Entity. Often this document is published in html and/or as pdf and is used by the standard setting entity as part of its approval process. Since it is not the intent of this specification to fully reproduce the human-facing content and formatting of the source document, it is recommended that this document be transmitted as part of the competency framework package. This is an optional field in OpenSALT. If best practices are not followed, this field may be blank. Publisher: The entity that loads and publishes the Framework. 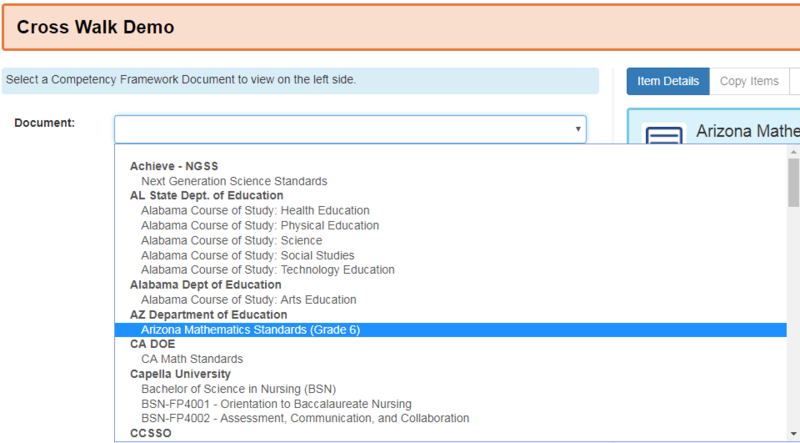 Note that in many cases, the Standard Setting Entity may lack technical capabilities to publish the Competency Framework in a standard format so a third party may be displayed. This is an optional field in OpenSALT. If best practices are not followed, this field may be blank. 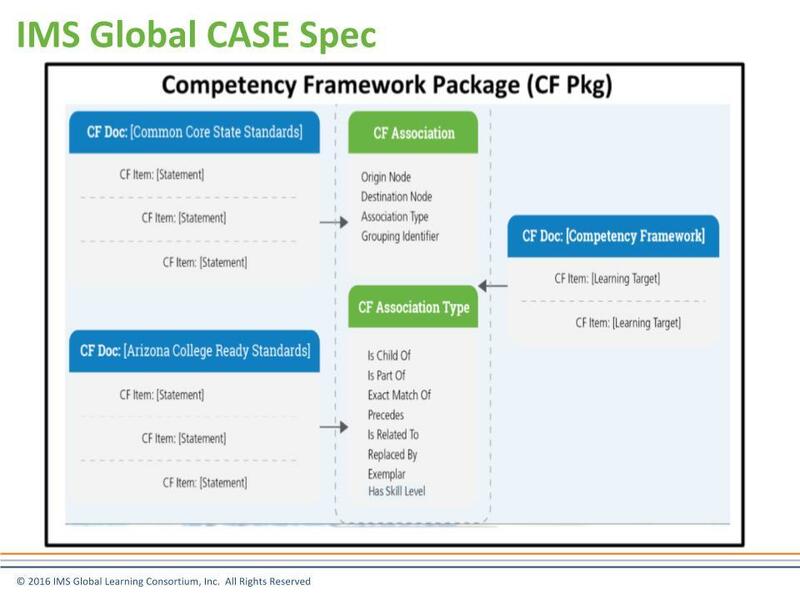 Subject: This is a string expressing the general subject area of the Competency Framework (e.g. Mathematics). This is an optional field in OpenSALT. If best practices are not followed, this field may be blank. AdoptionStatus: Adoption status displays the Framework’s current status as Draft, Private, Draft, Adopted, or Deprecated. OpenSALT assumes Adopted as the default if no status is specifically selected for the framework. This is an optional field in OpenSALT. If best practices are not followed, this field may be blank. OpenSALT assumes Adopted as the default if no status is specifically selected for the framework. StatusStartDate: The date that the CF Doc status started. This is an optional field in OpenSALT. If best practices are not followed, this field may be blank. StatusEndDate: This date is often only known when a new status is started. This is an optional field in OpenSALT. If best practices are not followed, this field may be blank. License: Systems may filter for content with particular licences to support discovery. This is an optional field in OpenSALT. If best practices are not followed, this field may be blank. Notes: Notes or comments generated by the Framework Publisher about the context of the Framework. This is an optional field in OpenSALT. If best practices are not followed, this field may be blank. The purpose of the second tab, CF Item, is to provide the user with items and content within the Framework Package. FullStatement: The the main content of the CF Item. It is used to express both nodes and granular statements. If the statement is part of a list, the list enumeration should not be included in the statement and should instead be contained in the List Enumeration in Source Document. This is a mandatory field in OpenSALT and the export will contain data. HumanCodingScheme: The ID sometimes used by humans to identify a CF Item. It often will use concatenated codes expressing its position in the taxonomy and abbreviations to convey other classification information (e.g. K.CC.1.1). This is an optional field in OpenSALT. If best practices are not followed, this field may be blank. SmartLevel: This is an optional field in OpenSALT. If best practices are not followed, this field may be blank. ListEnumeration: Used to parse out enumerations or bullets that precede CF Item statements. This is an optional field in OpenSALT. If best practices are not followed, this field may be blank. 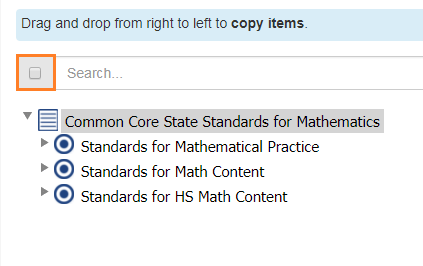 CFItemType: e.g., “Standard,” “Benchmark,” “Strand,” or “Topic.” or “Level 1, Level 2,…” This is an optional field in OpenSALT and may be blank. License: Systems may filter for content with particular licences to support discovery. This is an optional field in OpenSALT and may be blank. LastChangeDateTime: This is used for versioning. This is a mandatory field in OpenSALT and the export will contain data. The purpose of the third tab, CF Association, is to provide the user with items and content within the Framework Package. Identifier: The identifier is an unambiguous, synthetic, unique reference to the association. This is a mandatory field in OpenSALT and the export will contain data. 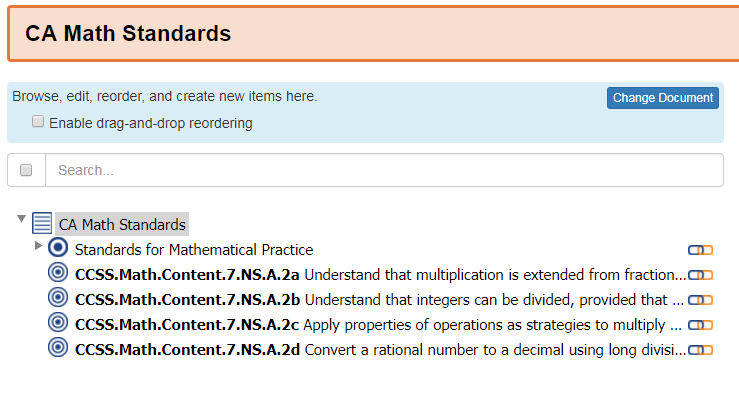 URI: Establishes uniqueness of an association between a learning standard and another learning standard or other objects such as learning resources. 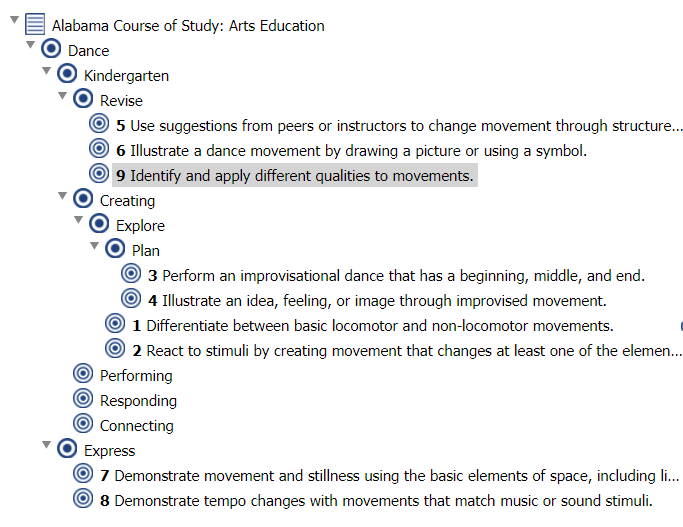 [CEDS Element: Learning Standard Item Association Identifier URI, ID:000871]. This is a mandatory field in OpenSALT and the export will contain data. 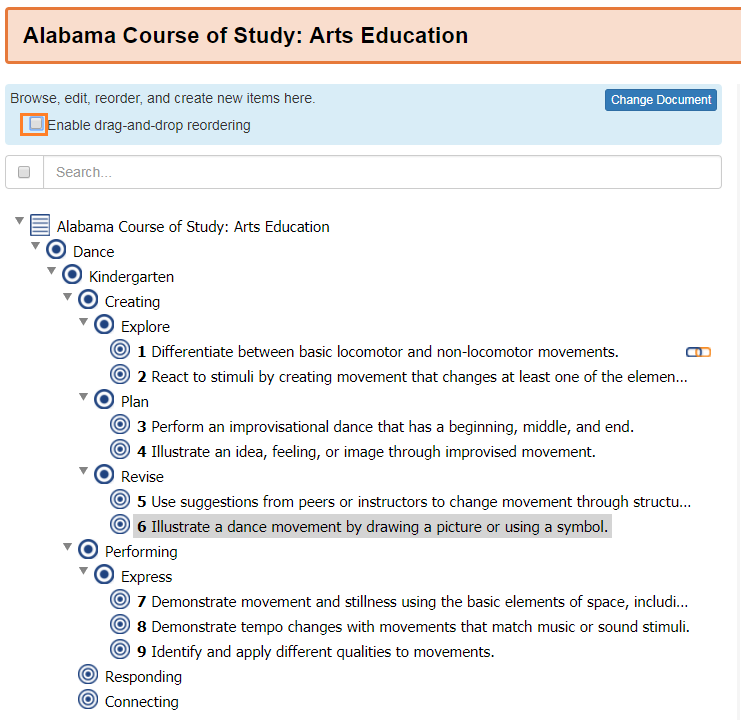 OriginNodeIdentifier: Identifier of the origin node when the Learning Standard Item Association is used as a connector in a learning map. [CEDS Element: Learning Standard Item Association Origin Node URI, ID: 001406]. This is a mandatory field in OpenSALT and the export will contain data. DestinationNodeIdentifier: Identifier of the destination node when the CF Association is used as a connector in a learning map. [CEDS Element: Learning Standard Item Association Destination Node URI, ID: 001404]. This is a mandatory field in OpenSALT and the export will contain data. AssociationType: A controlled vocabulary used to express the types of associations used to describe the relationship between CF Docs and between CF Items. This is a mandatory field in OpenSALT and the export will contain data. AssociationGroupIdentifier: An identifier to allow associations to be grouped together. Different values only have to be unique within the document. This is an optional field in OpenSALT and may be blank. AssociationGroupName: A common group name to allow associations to be grouped together. Different values only have to be unique within the document. This is an optional field in OpenSALT and may be blank. LastChangeDateTime: A system generated log of the most recent change to this record. This is a mandatory field in OpenSALT and the export will contain data. The fourth Export option is the HTM Archive button. The purpose of this Export option is to produce an HTML code snippet that can be used on an alternative website that renders the framework in a consistent manner to the display on OpenSALT. Users will note that at this time the button is not active. A description will not display when a user mouses-over the button, nor will the button respond with clicked. This is a placeholder for future functionality. As of the current release of OpenSALT this feature is not available. Though it is on the road map and is expected to be in a future release. If any organization requires this functionality, you can sponsor the development of the feature to help prioritize the development timeline by contacting PCG,ACT, or School City to discuss development costs and your needs. The final share option to connect to the Framework Package outside of OpenSALT is the Browser Link. OpenSALT provides the users with the direct URL for the selected Framework Package as both a hyperlink and display the text of the unique URL. The sure can copy the URL to us in any document, application or website. The URL will return the audience to the selected Framework’s Display page within OpenSALT when followed. Any user will be able to access the selected Framework package as no credentials or login are required when following the URL link. 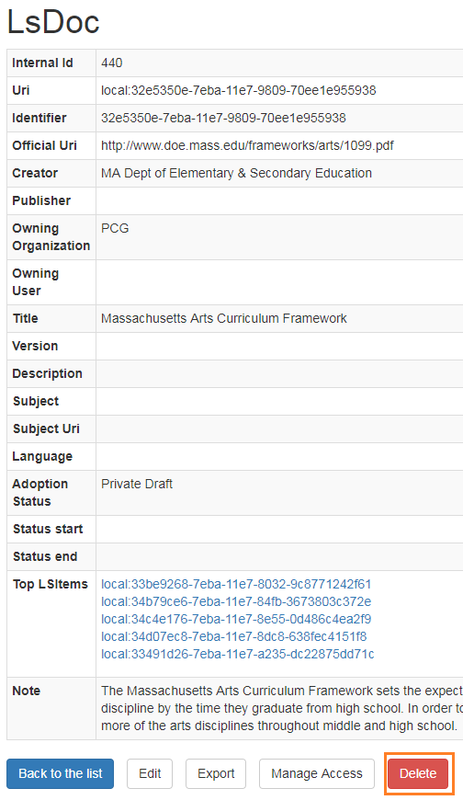 Published frameworks are able to be commented on by authenticated users for the purpose of collecting feedback on framework item metadata. Commenting must be turned on by a system administrator. Provisioned users are able to upvote and reply to other users comments. You are able to delete comments that you have written as well. 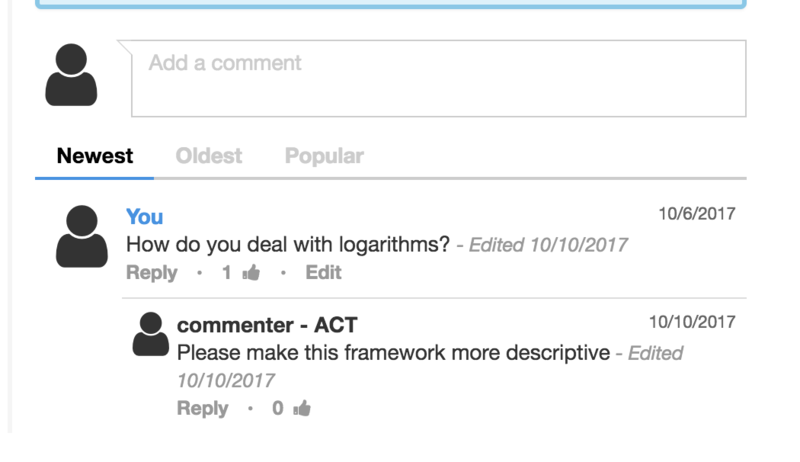 Simply navigate to any framework item and make your comment, or upvote/respond to others previous comments. The comment panel may be hidden - it will be on the bottom of the ride side panel. You are able to sort comments by the three tabs - newest, Oldest, and Most Popular (see graphic above). You may use these tabs to sort comments in the way that suits your interest and purpose best. Comments are not a part of the framework itself but independently stored. Due to a feature that truncates the email address of a participant, users cannot start their usernames with the @ symbol. OpenSALT has integrated with this third party code with a congruent MIT license in order for reviewing frameworks. Users have the ability to create their own accounts and organizations on signup. Select “Sign up” from the top right page or Log In page. User enters their desired email address and password (twice). They cannot enter an email address already in use and their passwords must match. They also can select their Organization and if no Organization exists, create one. Once the Super Admin receives an email notification, they can navigate to the USer List page and Approve or Suspend/Reject the user. © Copyright 2018. Revision cb7366b1.